Need a Smaller Sized Water Feature or Fountain? The Sound and Sight of Relaxing Trickling Water Adds a memorising Dimension to nearly any space. Need to install Your Water feature or Fountain in shade? then choose a small feature that has a remote solar panel, this way You can locate the panel in a sunny position, on top of a fence, trellis or roof is perfect. 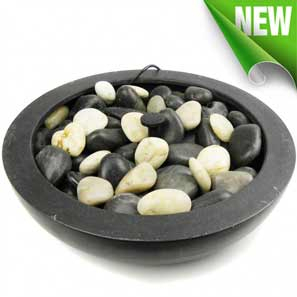 Powerbee offer some of the BEST Prices on small Water Features & Fountains, our Prices Include Guaranteed Tracked Delivery and VAT. We use 48 hour GPS Tracked Service, at NO extra cost. PowerBee Ltd have been Specialising in Water Features for nearly 10 years, we have Selected only the Best Fountains that work in for the UK weather! Our Range of Water Features, are designed to use Power very efficiently, our Fountains are Now Mainstream for Gardens all over the UK. We are one of the Longest Standing Feature Specialists. We take great care in selecting every single product we sell, it must meet the Powerbee Standard of Quality which is High.